Due to unforeseen reasons this product can momentarily not be ordered nor shipped by the pharmacy. We are looking into alternatives. Ibuprofen belongs to the so-called Non-Steriodal Anti-Inflammatory drugs (NSAIDs). It relieves pain and reduces inflammation. Ibuprofen is also the active ingredient in various well-known brand drugs such as Advil and Nurofen. 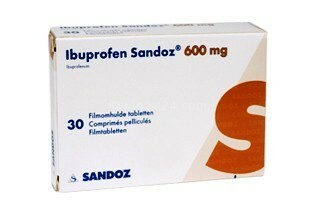 You can also buy generic Ibuprofen over the counter in 200mg and 400mg tablets. The Medix24 offers the 600mg tablet which is only available on prescription. Used for treating: muscle and joint pain, back pain, nerve pain, inflammation, migraine, headache and period pain. Tablets: swallow whole with a drink of water. Take with or after food to reduce side-effects. Important: read the package information leaflet carefully before using this medication. How does Ibuprofen work against pain? Ibuprofen is an anti-inflammatory drug, also called Non-Steriodal Anti-inflammatory drug (NSAID). It is used to reduce inflammation and relieve pain. When you suffer from arthritis or other infammations of the joints, Ibuprofen can help you manage pain. Ibuprofen works by blocking the production of chemicals that cause inflammation, pain, tenderness, swelling and increased temperature. Because of this, many people will find their mobility will increase. How should I use Ibuprofen? Ibuprofen is normally taken three times per day with a glass of water. You should stick to the prescribed dosage and not exceed the recommended daily dose as high doses for a long time may cause heart attacks or strokes. Does Ibuprofen have any contraindications? Please note: Ibuprofen should not be taken by children, pregnant women or the elderly. Please note: Ibuprofen may decrease fertility in women, it is therefore not recommended when you are trying to conceive. Which side effects can Ibuprofen cause? Ibuprofen may cause side effects. Although these are usually rare and not severe, please contact your physician if you experience severe or unexplained side effects. Seek immediate medical advice if you have skin rash, lesions or any other sign of hypersensitivity or if you experience breathing difficulties, bronchospasm, an asthma attack or if your asthma becomes worse. Also seek immediate medical advice if you have blood in vomit or diarrhoea or if you have any other unusual stomach problems as this may indicate perforation or other very serious conditions. How can I buy Ibuprofen online? You choose your desired dosage. In the next screen, fill in your contact details, answer the medical questions and select your payment method. The answers to your medical questions are reviewed by a fully certified physician connected to Medix24. Upon approval of the doctor your order is forwarded to one of the pharmacies who work with Medix24. The pharmacy will ship your order in a discreet package to your home address using Next Day Delivery. This description is based on prescribing information approved by the Medicines and Healthcare Products Regulatory Agency (MHRA), but in no case replaces the advice of a doctor or pharmacist. For a full overview of the usage, contraindications and side effects of Ibuprofen, please download the patient information leaflet.